This past weekend The Island School hosted the SEA Change Youth Summit with musician, Jack Johnson and 5 Gyres to raise awareness about the impacts of plastic pollution in the ocean and to inspire young students to be advocates for change. 34 Students gathered from Abaco, Grand Bahama, New Providence and Eleuthera as well as a school group out of New York and another student from Jamaica. Students, chaperones and facilitators of the summit gather before the beach clean up. 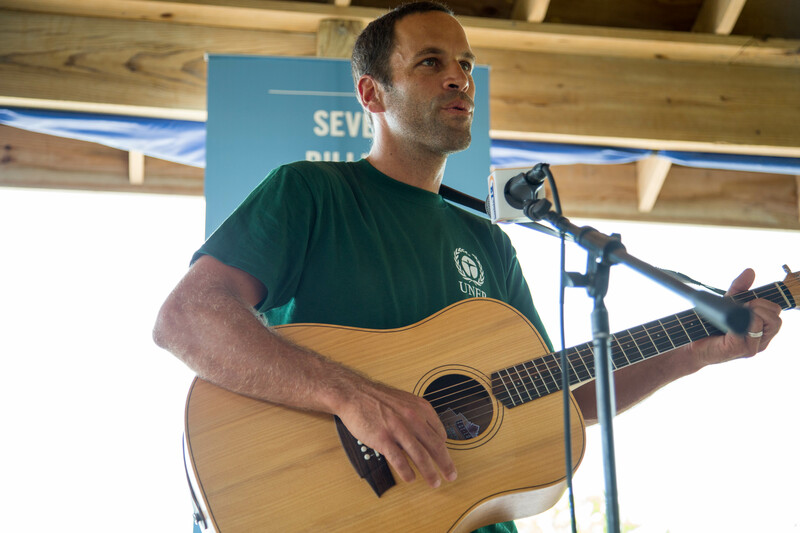 Musician Jack Johnson plays a few songs at the UNEP Designation where he was recognized as a Goodwill Ambassador. 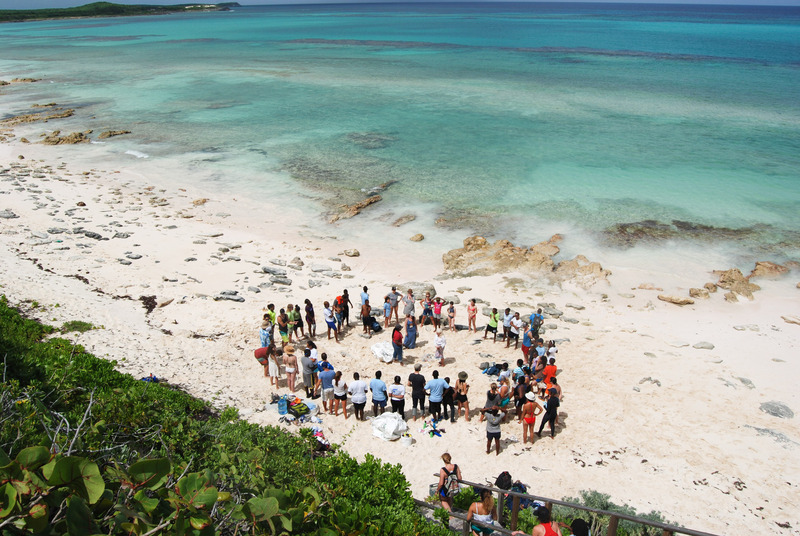 Included in the kickoff to the festivities hosted on The Island School’s campus were remarks from Chris Maxey, founder of The Cape Eleuthera Island School, Anna Cummins and Marcus Eriksen, founders of the 5 Gyres Institute and Celine Cousteau, film maker, environmentalist and daughter of ocean explorer Jean-Michel Cousteau and the granddaughter of Jacques Cousteau. Also in the line up was Kristal Ambrose, founder of Bahamas Plastic Movement and Minister of Education, Science and Technology, The Hon. Jerome Fitzgerald. 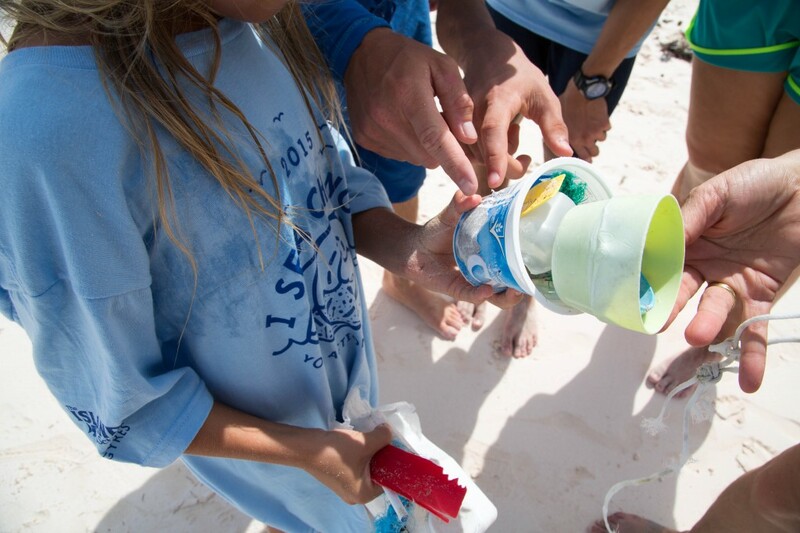 Summit attendees inspect some of the plastics found during the beach clean up. The first day of the Summit centered around raising awareness on the issue of plastic pollution so that the students could create their own solutions based on the stories and information they’d received. In the afternoon students, facilitators, Jack Johnson and visiting UNEP representative, Naysan Sahba visited a local beach to do a clean-up lead by Kristal Ambrose. The day finished with a Junkanoo, cultural activity lead by Art teacher and Space to Create founder, Will Simmons in which Summit attendees, Island School students and Jack Johnson created original songs about plastic pollution to the Junkanoo beat provided by the visiting South Eleutheran students from Preston H. Albury High School. 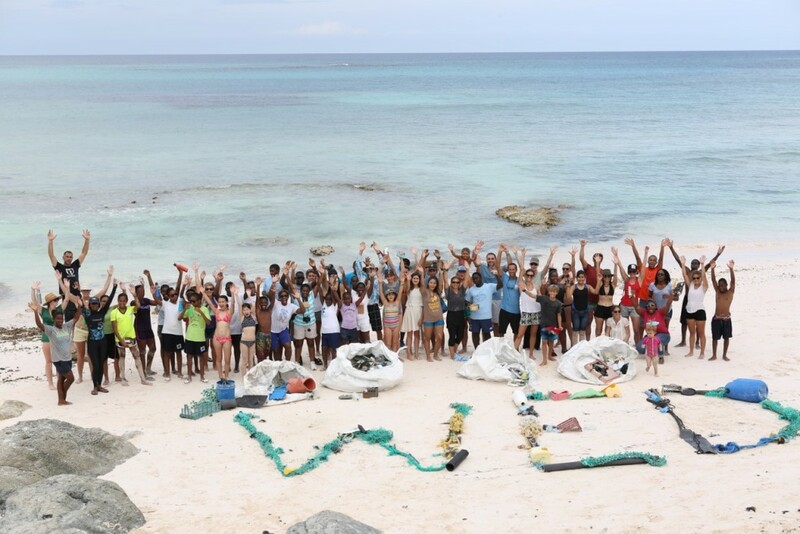 Summit attendees, 5 Gyres, and Jack Johnson celebrate World Environment Day on June 5 and show off all of the beach plastic they gathered. The second day began with a workshop on how to reduce single-use disposable plastics in the household. Students were given tips and tools on how to make their own toothpaste and steer away from buying highly packaged products and personal care products containing plastic micro-beads. After lunch, David Stover, co-founder of Bureo Skateboards told his story of making skateboards from fish netting found in the ocean and beaches of Chile. 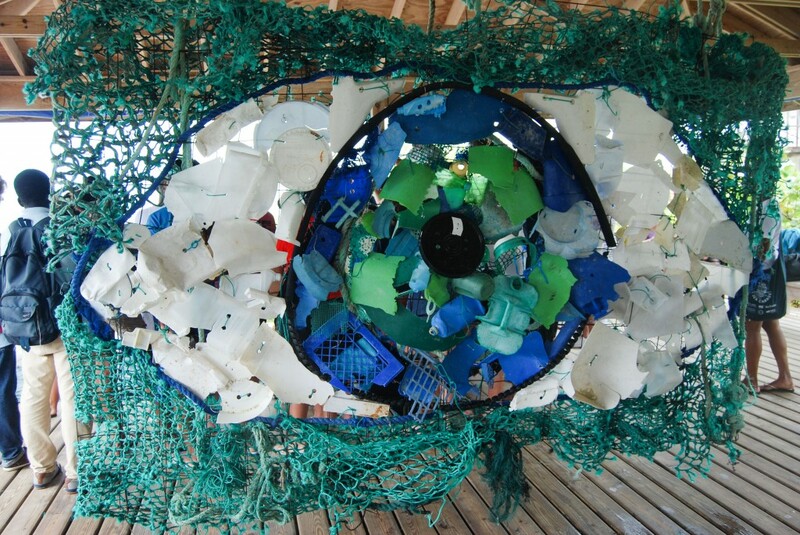 The students then sifted through their findings from Friday’s clean-up to create a symbolic SEA Change eye sculpture out of plastics with Dianna Cohen, founder of Plastic Pollution Coalition. The sculpture was then showcased at the Deep Creek Homecoming where Summit attendees enjoyed a plastic free event thanks to a donation by World Centric for all food packaging. Recover also pitched in with a donation of t-shirts for the homecoming made from recycled plastic bottles. 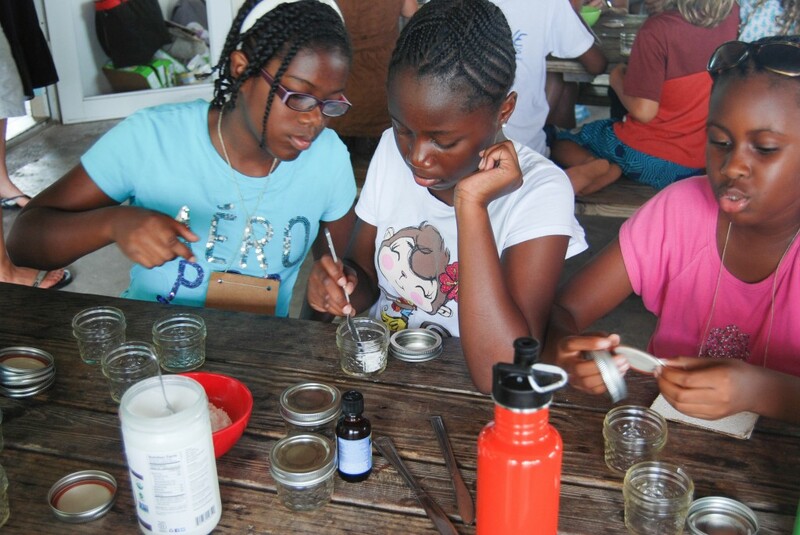 Students at the summit make all-natural toothpaste. Using the beach plastic the the students found during the beach clean up, they created a symbolic SEA Change eye sculpture with Dianna Cohen, founder of Plastic Pollution Coalition. The sculpture was then showcased at the Deep Creek Homecoming. Thank you to event supporters: Johnson Ohana Charitable Foundation, AML Foods, Cape Eleuthera Resort & Marina, Recover, World Centric, From the Bow Seat, Bahamas Waste Limited, Cable Bahamas, One Eleuthera, The Muggia Family and Kim & Floyd Wilson. Blackbeard, the Manatee, in Boathouse Cut! 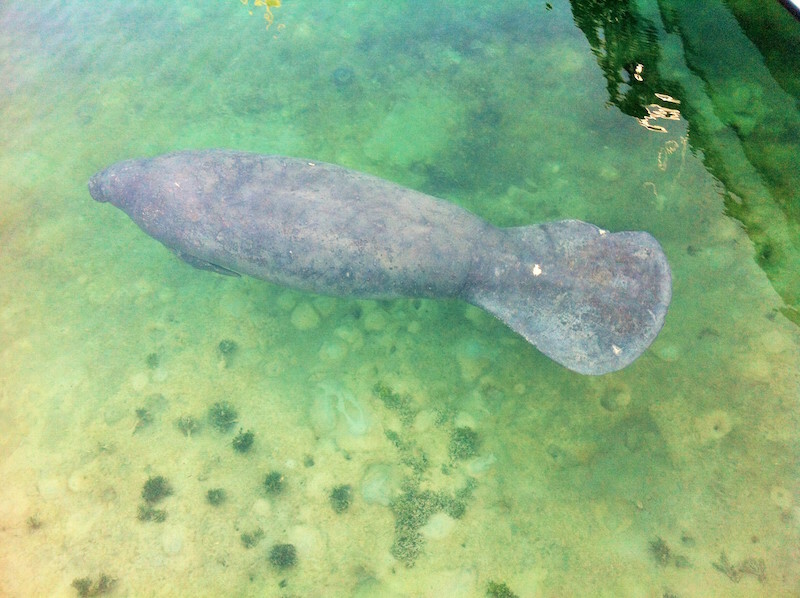 This morning we were visited by a large manatee in the Boathouse Cut! Educational Programs Lead Educator, Tiffany Gray, shared photos and information on the sighting with Bahamas Marine Mammal Research Organization who informed us that our manatee friend is named Blackbeard who is originally known by our US colleagues from Tampa Bay. He has been in the Bahamas since 2013 where he has spent time in Long Is, Cat Is, north Eleuthera (with another manatee “Gina”). From there he headed to Nassau in December 2014 and remained until late April when he was seen back in Spanish Wells with Gina. 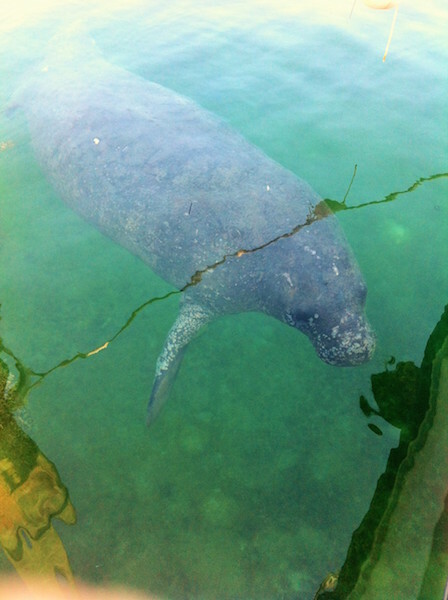 Manatees are not common to The Bahamas due to the lack of fresh water so this sighting is very exciting! 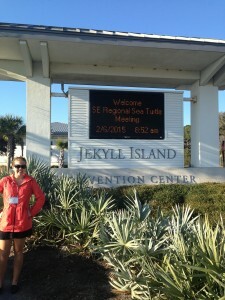 We hope Blackbeard sticks around for at least a few more days! 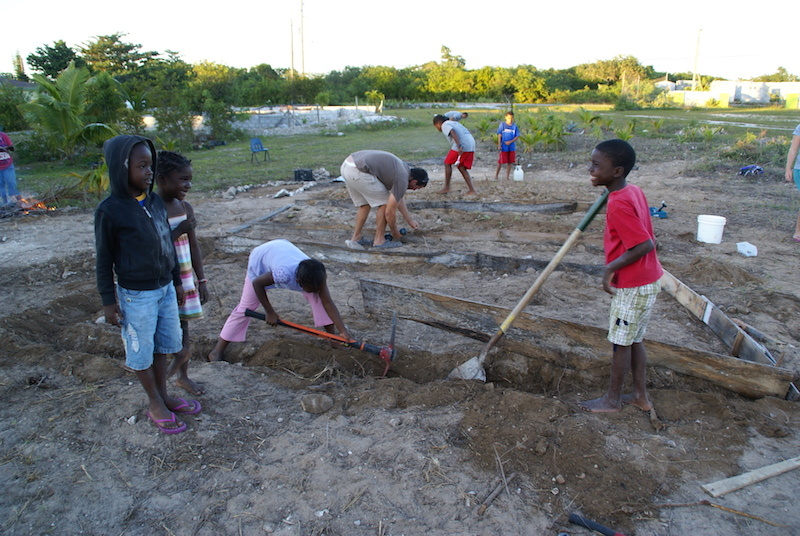 Deep Creek Primary School, with the assistance of The Cape Eleuthera Institute (CEI), has started a new initiative to build a school community garden with the aim to provide students with access to healthy meals and nutritional awareness. The planning phase for this project began in October. Deep Creek Primary School teachers and CEI staff met to discuss the potential of a collaborative project that would not only be educational but also provide students with the opportunity to gain valuable practical skills. A Parent Teacher Association meeting held in mid October ensured that all key-stakeholders were incorporated in the planning process and that there was sufficient backing to support the initiative. The meeting was a great success with demonstrated support from teachers, student’s parents and local community members. An assessment of the surrounding grounds was completed by the key-stakeholders and an area adjacent to the school was chosen for the location of the proposed garden. In early November the first gardening day was held with a great turn out; 21 community members and 8 CEI staff came together to start clearing the borders of the land so that grow-beds could be constructed. Weekly gardening days were arranged to continue land-clearing efforts and seedlings were planted in preparation for transplanting into the anticipated grow-beds. 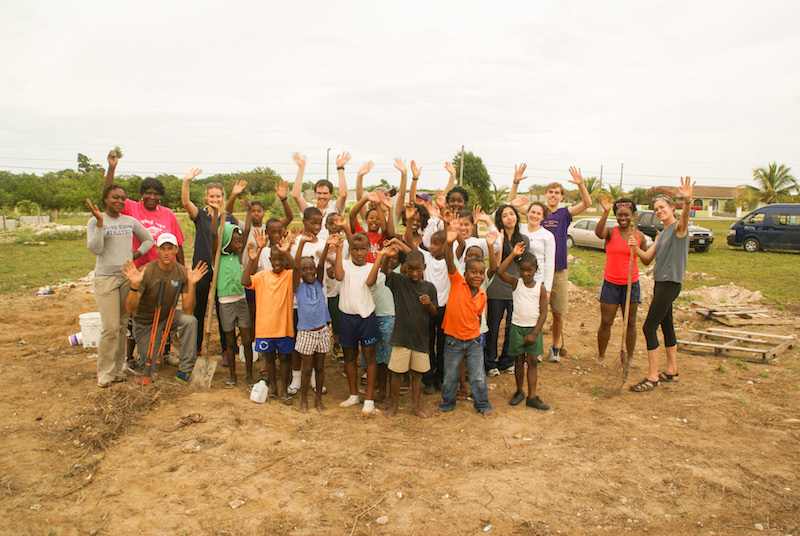 The great physical effort of clearing the land was alleviated in late November by The Cape Eleuthera Resort and Marina, who kindly helped support this initiative by donating the use of their back-hoe to assist with clearing the large area of land and digging holes for fruit trees. This support was an enormous help to further the project. Each class will have their own grow-bed, which they will be responsible for the up-keep of, creating ownership and competition between classes. Maintenance of the garden and respective class grow-beds will be incorporated into student daily chores. The combination of ownership that students have over the garden and competition between classes will motivate students and hopefully ensure the success of the project! This endeavor will not only provide students with useful knowledge but also requires them to be responsible and accountable for a project, a great life skill to practice. In early December, a couple of fruit trees were planted, 7 of the class grow-beds were constructed and the previously potted seedlings were transplanted to the garden. Future plans include planting many more fruits and vegetables in the garden so that healthy meals can be produced for students at the school, and increasing education and awareness amongst students about a balanced, nutritional, healthy diet. The lionfish, an invasive predator from the Indo Pacific currently wreaking havoc on Caribbean and South American coral reef fish populations, was first introduced to the region through the exotic aquarium trade. These beautiful carnivorous fish have characteristic orange and red stripes, spotted and striped pelvic and caudal fins, and flamboyantly colored wide-spreading pectoral fins, which they use to corral prey. These fins, though possibly to blame as the instigators of the devastating invasion, are now offering a new way to help control the rampant spread of the predatory fish. 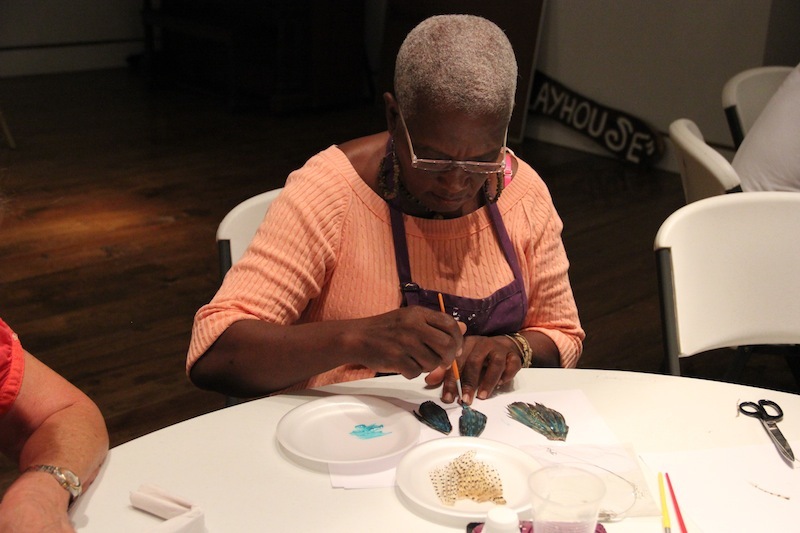 Last week, in collaboration with CEI, the Eleuthera Arts and Cultural Center hosted a Lionfish Jewelry Making and Awareness Workshop, the first of its kind in The Bahamas. 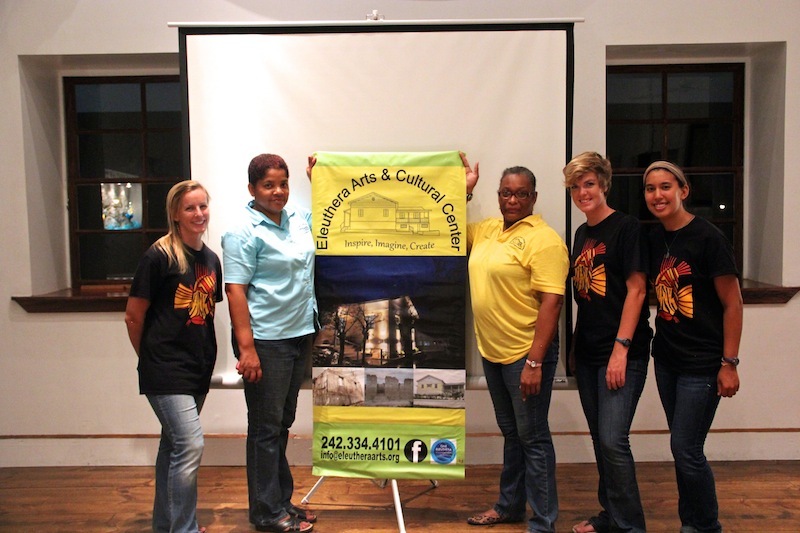 Local artists Shorlette Francis and Sterline Morley joined the Arts and Cultural Center’s Audrey Carey and CEI’s Dr. Jocelyn Curtis-Quick of the Lionfish Research and Education Program to put on the event. The collected attendees, a mix of professional artists, handicraft enthusiasts, and interested community members, learned about the arrival of the fish in the Caribbean in the mid-1980’s and its subsequent spread. 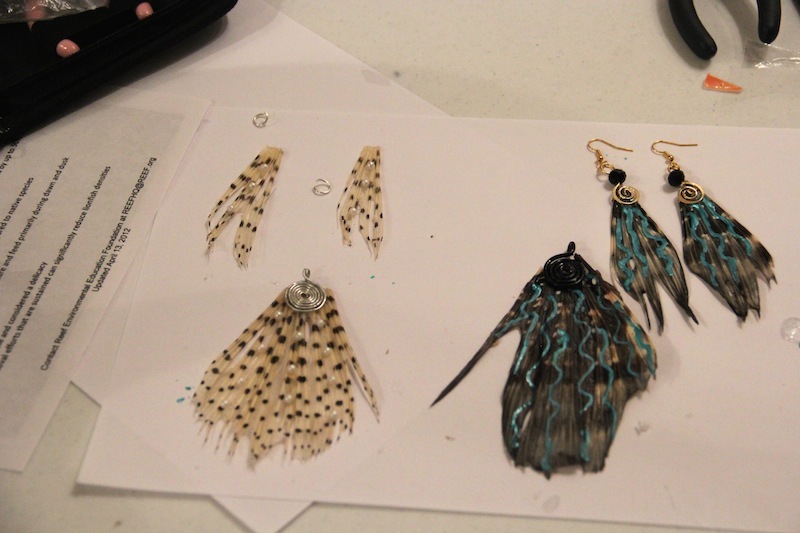 After sampling fried lionfish and perusing lionfish crafts and jewelry by local artists for inspiration and construction techniques, the group tried their hand at creating wearable pieces from the fish’s unique fins. Participants rolled up their sleeves and got creative, making beautiful necklace and earring pieces. Fins were varnished in their natural state or painted for more varied coloration; they could be trimmed, layered, or beaded. Enthusiasm about the finished products and the versatility of lionfish fins as a material led to many questions about where to get more of them, and will hopefully work to increase local demand for the fishing of these problematic fish. 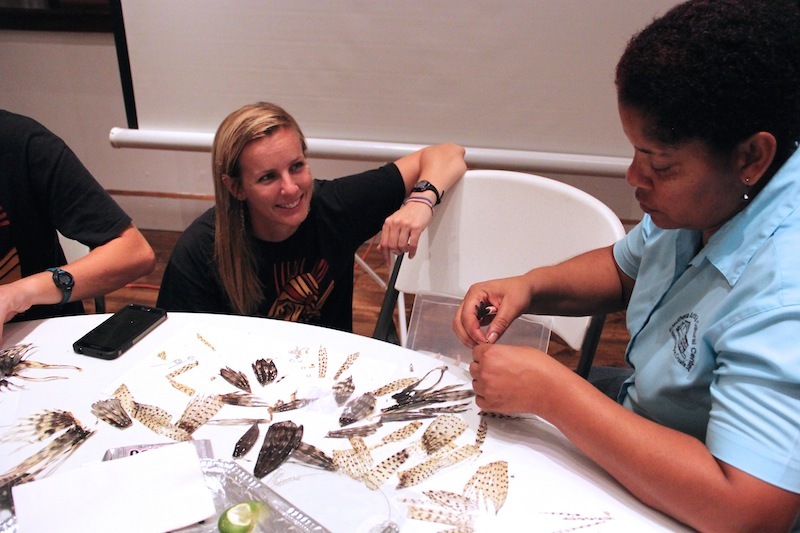 Be on the lookout for more jewelry workshops around Eleuthera, and for beautiful lionfish pieces to purchase. Do your part against the invasion by eating and wearing lionfish! For the Island School summer term, six students had the opportunity to work with Dr. Jocelyn Curtis-Quick researching invasive lionfish. In one day, the students became professionals at cast netting, dissecting lionfish, conducting behavior observations, and data analysis. They dissected fourteen lionfish, with body fat ranging from% 0.58- %2.1 and the discovered of various prey items in the stomach including crabs, grunts, and blue headed wrasse. Shockingly, there were twelve fish in one stomach; proving the voracious eating habits of the lionfish. The students are now knowledgeable invasive lionfish researchers. Of course, the students love to eat lionfish and recommend everyone do their part to stop the invasion by eating them. Students help conduct lab observational experiments. 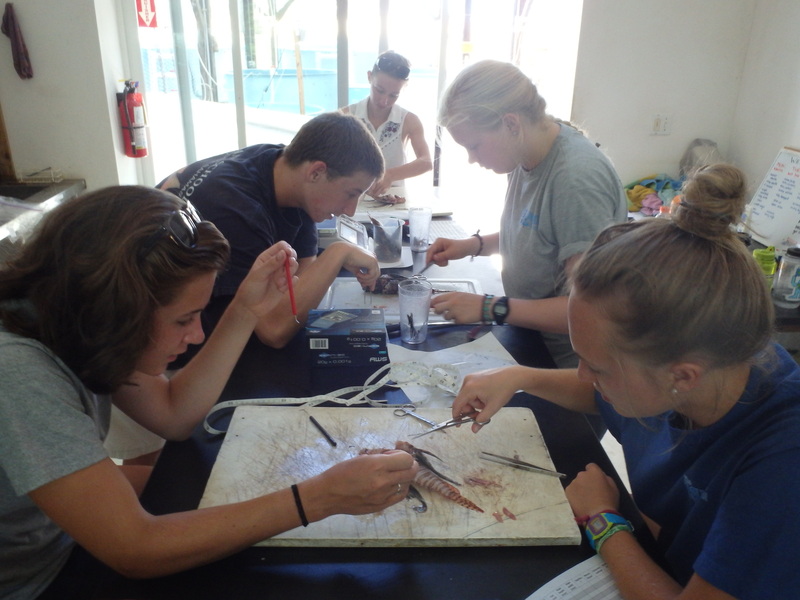 Summer term Island School students dissect lionfish. 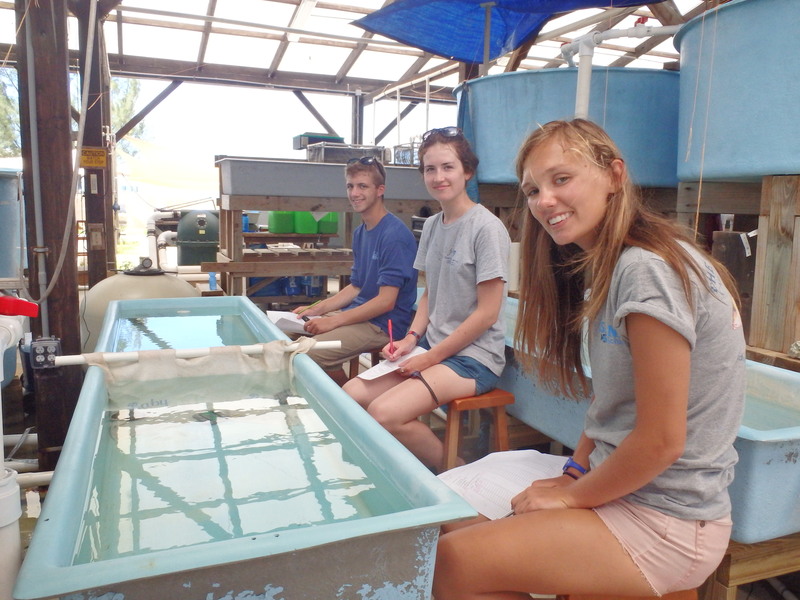 The Island School, Cape Eleuthera Institute, and Center for Sustainable Development have a number of internship and work opportunities still available for the 2014-15 academic year. You can learn more about all of the opportunities on our websites. 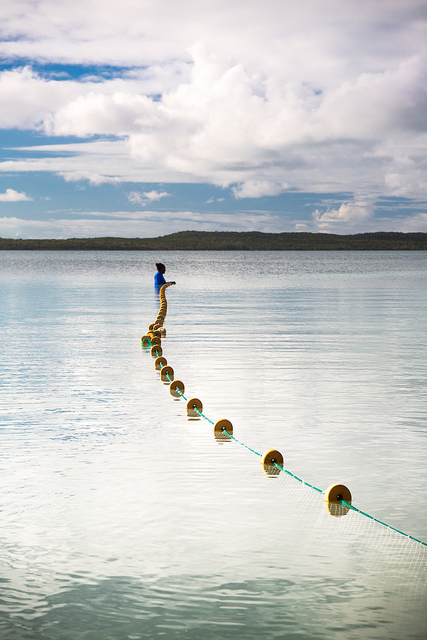 For specific questions, please email info@islandschool.org. Professional fashion and beauty photographer, host of TV’s The Face, and judge on America’s Next Top Model recently toured the campus’ of The Island School and The Cape Eleuthera Institute while vacationing with his family. Mr. Barker was impressed with our commitment to sustainability and variety of programs offered by the organization.